You will find carefully researched and professionally written SAAS related whitepapers and articles that will help you navigate the complex business environment we live in. From status page guides to incident response plans, we strive to become a leading resource in the SAAS landscape. The IT industry is experiencing a costly challenge to provide the highest level of support while trying to manage the ever-increasing budget. The average salary of your technical staff is steadily increasing and modern IT organizations are being asked to cover a wider footprint with fewer resources. This includes providing a high level of customer service with a minimal level of support personnel, causing increased stress on your staff and increased pressure on your budget folks to staff appropriately. For this reason, customer service ROI (return on investment) is getting a lot of attention. There are so many tools that we have at our disposal today to provide efficiencies, case management, CRM and accounting among others and it is critical that we use these tools within our organization’s support strategy. However, there are budget implications with every new tool acquired and it is important that investments pay for themselves in the end. This article will discuss the challenges associated with running an IT help desk in 2017, some current support trends, salary trends and the return on investment of a hosted status page. A typical IT help desk consists of a tiered support model and your tier 1 staff is generally tasked with answering phone calls, triaging tickets and providing basic troubleshooting for your users. What many organizations do not realize is that these are the folks that set the tone for your organization. These are the people that are interacting with your customers and these customers are then drawing conclusions on your entire organization based on that interaction. These basic tools are critical to the success of tiered support teams and are crucial for delivering high-quality service. This will ensure that when a customer contacts your help desk he or she will be greeted by confident staff with the tools needed to complete the interaction. By solving issues efficiently and communicating with your end users intelligently you will boost your company’s reputation, which in turn will lead to higher levels of consumer confidence. Rising ticket and call counts are leading to increased organizational expenditures, especially when you have an incident with one or all of your services. The HDI report survey also lists average salaries for help desk staff based their support level. On average, Tier 1 salary is $44, 545 per year, which is an hourly rate of $21.42. Employee cost will be important later in this article when we are calculating the value of a hosted status page. The HDI also estimates that there are 300 million help desk tickets per year and each ticket will cost an organization around $20. This is pretty significant if you think about your organization and the number of help calls you receive per year. Because you typically have a large amount of people calling at the same time during an incident or unplanned event, these average costs are further magnified. Customers are now used to visiting online portals for help which is a big change in the modern IT support chain. In turn, portals are climbing up the list. This is great for IT organizations because they do not have to spend money at the initial interaction layer of the support cycle and can focus their resources on resolving the incident or request. A status page is a single website that your customers can visit to get a look at the status of your services and organization. It usually lists an overall status of all of your services and then an individual status for each of your services. The status page should double as a communication tool and allow users to subscribe to receive updates. The updates are normally delivered via email, SMS, webhook or other integration methods. There are many basic features that every status page should have but the best solutions offer additional features. For example, users should have the ability to subscribe to specific services and only receive notifications about the services that they care about. Another thing to consider is whether or not the solution offers in-house SMS functionality or requires you to utilize a 3rd party service which can become cumbersome to integrate and add an additional cost to your status page. These are some of the features that really set hosted status page services apart from the competition. The change from walk-in style support to the use of portals is a great sign that an organization may see tremendous value with a status page since users are looking online for answers. It is important to remember that a status page should involve notification features to feed your users information on your organization. 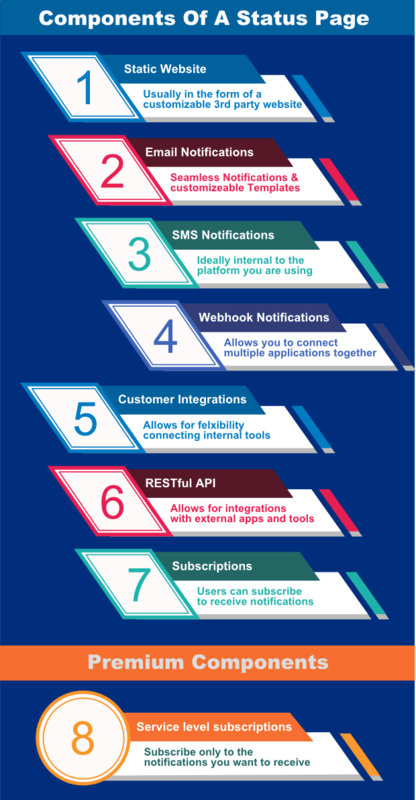 A push style method of emails / SMS / webhook services to notify users of downtime, future maintenance events or degraded service status will significantly reduce the number of inbound support calls/tickets. Last, a status page should not cost you an arm and a leg and you should make sure that the features are worth the price that you will pay. A status page will typically cost an organization between $100 and $400 per month. The cost will be calculated by the number of subscribers you anticipate, the number of team members and which features you need within your solution. When considering any new software or service that carries a budgetary impact, the challenge is always justifying to your superiors that the value gained is worth the cost. This exercise typically involves a business justification, many meetings, and the ultimate financial approval. This process can be very tedious and stressful from start to finish but it doesn’t have to be that way. A status page is an easy service to justify within your organization and I am going to show you the direct return on investment you can expect from implementing a hosted status page. The data presented may not be indicative of your exact situation but it will give you a guideline to computing your own customer service ROI metric. The data we are using has been collected from many IT organizations to form the averages and approximations for the purpose of this example. It is important to understand the components that a status page will bring into your organization and how these will affect your current support structure. A lot of organizations are failing at properly communicating outages. A status page service brings a whole new level of customer service to your organization and this should be factored into the ROI analysis. Let’s take a few moments to think about a typical IT organization and work through an easy customer service ROI analysis. For this exercise we will take a look at a sample company called Altair. Altair is a SaaS service provider with several product verticals in multiple industries. This company has 2,000 active customers in 5 countries around the world. With these quick stats, we can now start to draw some financial conclusions based on the monthly volume and industry average salary data. In this case study, Altair staff is fielding around 600 phone calls for service each month and another 900 by email. The HDI salary survey let us know that the average salary for a tier 1 technician is around $45,000 and the average cost of a support call is around $20. Average support tickets jump about 25% during an incident. An incident is an organization’s test of their customer community and will set the standard for the organization’s support reputation. Altair realized that during an average incident, their tickets increased to 89 from the average 71 per day, costing the organization an average of $1,786 dollars to support the incident. This does not factor in the actual technical resources that were tasked with resolving the incident. Altair analyzed this data and started looking for a solution to reduce support calls and to provide a higher level of service to their customers. They started looking at hosted status page providers that would fit their needs. They found several providers, compared features and determined their price based on their customer/user count. The average price for an organization their size was around $249 a month. They looked at the cost of the incident and also computed the fact that they have on average 7 incidents a month. Altair also researched some statistics and found that by having an active status page they could see a 24% reduction in support tickets. As you can see in the chart below, having a status page would save them $3,000 a month and clearly cover the cost of the status page. 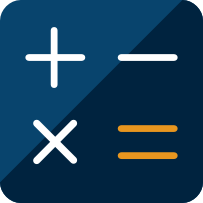 We built an ROI calculator so you can input your own numbers and see how your scenario stacks up against Altair’s. This was a no-brainer and they began their planned status page release. However, they were aware that they needed an effective communication strategy to direct their customers to a status page and if done right, the status page would provide a gold level of service to their customers, save the organization money and provide the technicians a reprieve. The communication strategy included placing a link to the status page from their actual support page. Some status pages provide widgets that indicate if there is a problem, further enhancing communication on key pages on a customer’s site. As you can see can see for a smaller organization, a status page can make a big difference. The single point of contact for your organization’s services is critical and has become the new expected level of support. A status page is always on and always the source record when communicating status of your organization. You were able to see how an organization like Altair was able to benefit from a status page and justify it financially with ease. This is an exercise that you can do for your organization that is sure to produce the same results. Imagine the ROI for organizations that have 30,000 customers as opposed to Altair’s 2,000. The ROI is huge and the cost of the status page quickly becomes negligible. Impact of an incident or outage on your organization? Cost per month / year for a status page? You can use this data to calculate the ROI that your customer service department would incur by implementing a technological strategy and share it with any decision makers. Now it’s time to go out and find a service provider that has the price and all the features you need.